The Progress-Focused Approach: Where does meaning in life come from? How important is meaning in life and how do you get it? In psychology more and more research has been done into the role of experiencing meaning in life (e.g., Steger, 2017). The feeling that our life is meaningful indeed appears to be important. This feeling is associated with various aspects of wellness. Previous research has shown that positive affect is a predictor of meaning in life. A new study by Martela et al. (2017) tested this factor and several other factors which might predict meaning in life. 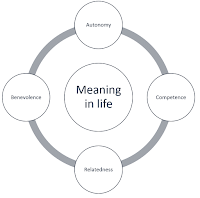 The researchers tested their hypothesis that four other factors, benevolence, and the satisfaction of self-determination theory's three basic needs of autonomy, competence, and relatedness would be better predictors of meaning in life than positive affect. In study 1 the researchers did a multiple regression analysis which showed that all four factors predicted meaning in life while positive affect not longer predicted it. Study 2 focused on memories of meaningful situations in the life of participants and showed that both the four factors and positive affect predicted meaning in life. Study 3 used a daily diary method and showed that daily fluctuations in autonomy, competence, relatedness, benevolence predicted, and positive affect. A brief longitudinal study showed that the four factors, measured at time 1, did predict meaning in life at time 2 while positive affect did not. 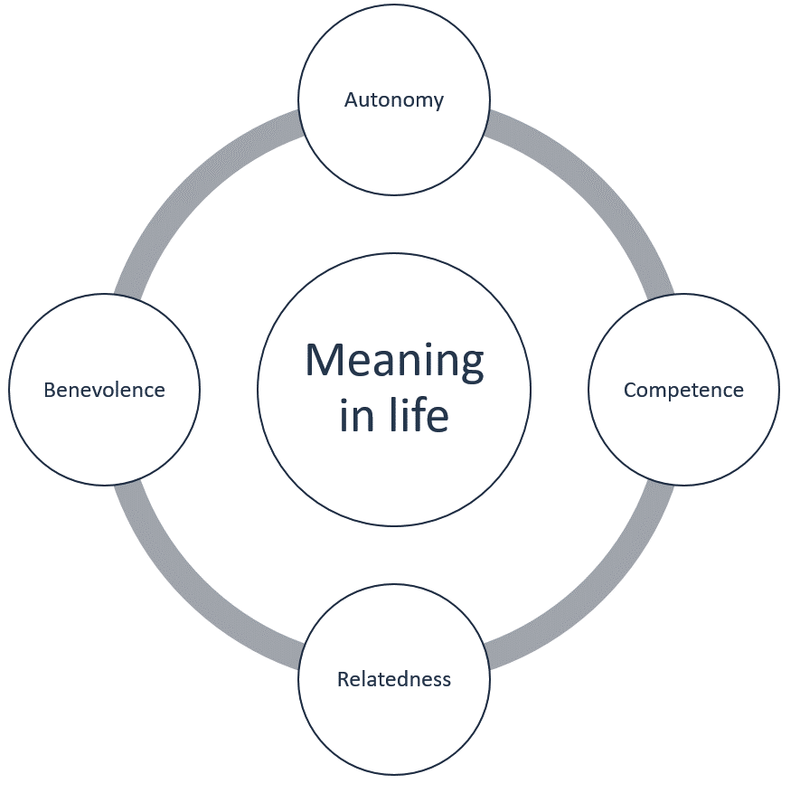 This paper shows the consistent association between perceived autonomy, competence, relatedness, and benevolence with meaning in life. The relation between positive affect and meaning in life can probably partly be explained by these other factors' association with meaning in life. It is possible to feel that your life is meaningful in the absence of an adherence to religious or ideological beliefs. The road to finding or creating meaning in life, these studies suggest, appear to be in the perception of being autonomous, competent, related, and benevolent. Feeling autonomous means that your are able to choose what you find interesting and important. Feeling competent means seeing yourself as capable of doing what you want and need to do. Feeling related means you feel that you are not only living for yourself but also with and for others. Feeling benevolent means that you perceive yourself as someone who does things which benefit others. I can imagine that when these conditions have been met, you will feel that your life has meaning, indeed. In this context, what is the difference between feeling related and feeling benevolent? Thanks for the question. The article says this about this topic"prior research has shown that autonomy, competence, relatedness, and beneﬁcence satisfactions can be empirically separated, and are all related to subjective wellbeing, independent of each other’s inﬂuence." The brief answer is: perveiced relatedness and beneficience (benevolence) are correlated yet conceptually and empirically different. Perceive relatedness refers to a feeling (of being related) whereas benevolence refers to behavior (acting prosocially).